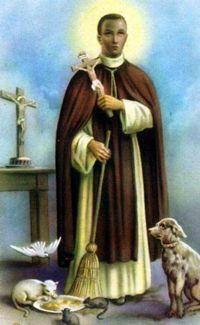 St Martin was born in Lima, Peru. He was the illegitimate son of a nobleman and possibly an African woman slave. He had a younger sister but soon after her birth, their father abandoned them. St Martin grew up in poverty with his mother who, unable to support him, sent him for two years to a Care School and then to work and train with a barber/surgeon. Although African and Indian descendants were barred by law from becoming full members of a religious order, St Martin’s persistence, commitment to the poor and prayer life, convinced the Dominican Order to receive him into their community. At first, he performed the duties of a servant but was then moved to the role of almoner (allocation of money to the poor). St Martin devoted his life to the sick, the poor and praying to the Blessed Sacrament. As a Lay Brother, he begged for alms to feed the hungry, the sick and his Dominican community. Often when there was no more space in their infirmary, he would give patients his own small bed. St Martin received extraordinary gifts: light filling the room where he prayed, appearing in two locations at the same time – often while tending to the sick, miraculous knowledge, instant cures and remarkable rapport with animals. When St Martin died his miracle work continued and he remains a greatly respected and frequently called upon Saint for his intercession. He is the Patron Saint of people with mixed race. His Feast Day is the 3rd November.